An original letter of correspondence between brothers and business partners Joshua Coffin Chase and Sydney Octavius Chase. Topics discussed in the letter include a check collected from trucker T. W. Swope that has been put on hold by the Winter Park Bank. 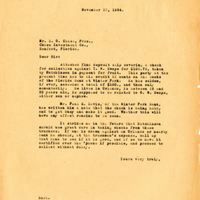 Original letter from Joshua Coffin Chase to Sydney Octavius Chase, November 27, 1934: box 49, folder 20.84, Chase Collection (MS 14), Special and Area Studies Collections, George A. Smathers Libraries, University of Florida, Gainesville, Florida. 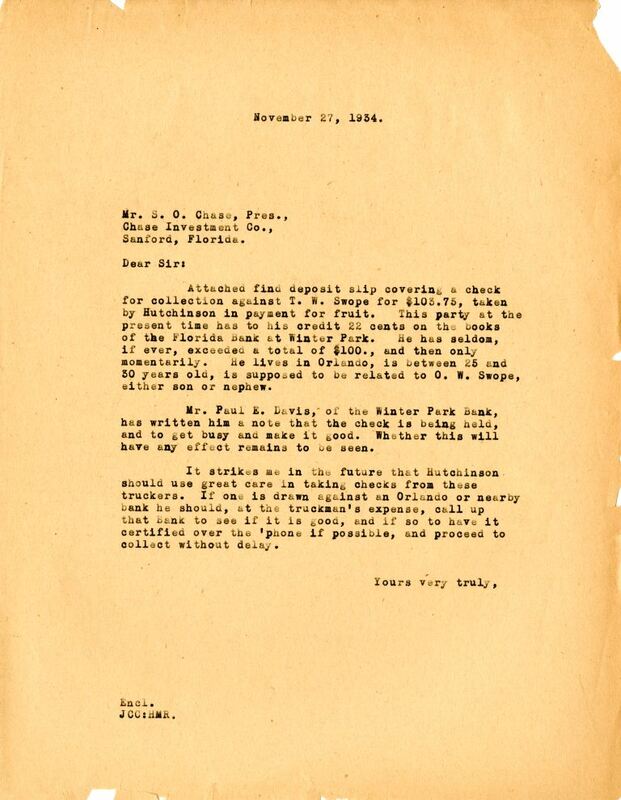 Digital reproduction of original letter from Joshua Coffin Chase to Sydney Octavius Chase, November 27, 1934. Attached find deposit slip covering a check for collection against T. W. Swope for $103.75, taken by Hutchinson in payment for fruit. This party at the present time has to his credit 22 cents on the books of the Florida Bank at Winter Park. He has seldom, if ever, exceeded a total of $100., and then only momentarily. He lives in Orlando, is between 25 and 30 years old, is supposed to be related to O. W. Swope, either son or nephew. Mr. Paul E. Davis, of the Winter Park Bank, has written him a note that the check is being held, and to get bust and make it good. Whether this will have any effort remains to be seen. It strikes me in the future that Hutchinson should use great care in taking checks from these truckers. If one is drawn against an Orlando or nearby bank he should, at the truckman's expense, call up that Bank to see if it is good, and if so to have it certified over the 'phone if possible, and proceed to collect without delay. Chase, Joshua Coffin. “Letter from Joshua Coffin Chase to Sydney Octavius Chase (November 27, 1934).” RICHES of Central Florida accessed April 18, 2019, https://richesmi.cah.ucf.edu/omeka/items/show/2739.